Camping rental fee includes site fee, water, electric, sewer, picnic table, fire ring, grill, heat, air conditioning, stove, refrigerator, microwave, pots, pans, dishes, silverware and cable TV. Cottage has bedroom with queen size bed and loft for sleeping. You need to bring linens, and cleaning supplies. 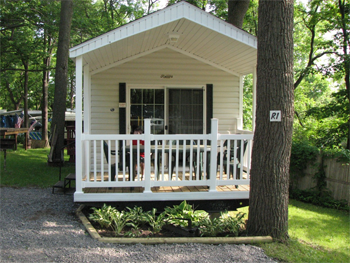 Cottage rental is for one family, 2 adults and children. Sorry, but local health ordinances do not permit pets or smoking in cottage. Check in 3pm, check out 11am.